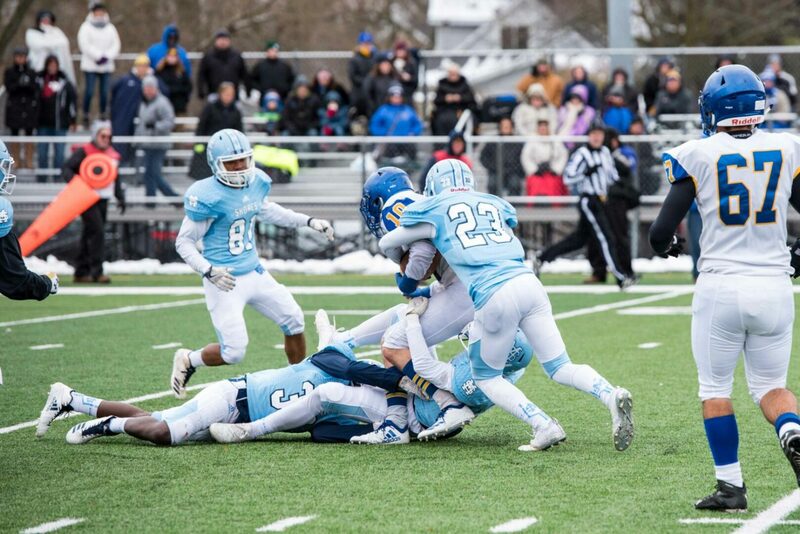 GRAND LEDGE — Early in Saturday’ Division 2 state semifinal game, it appeared that the Mona Shores football team might come up one win short of a return trip to Ford Field. 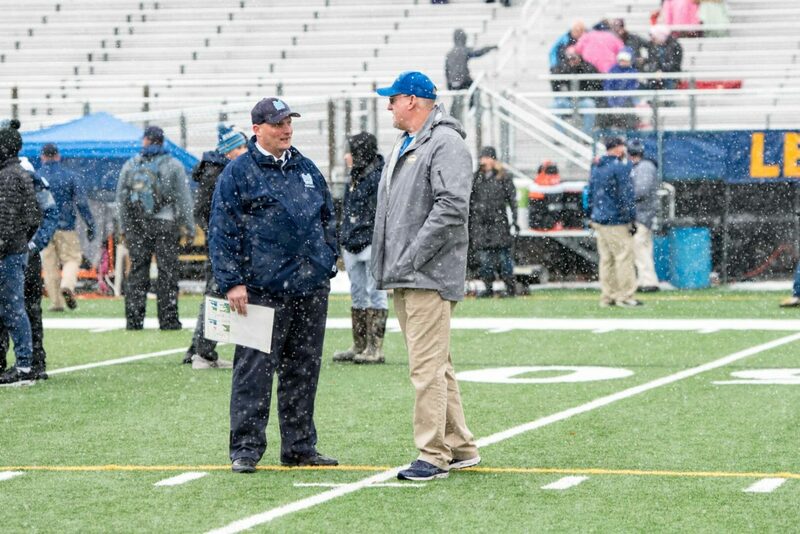 But the Sailors rebounded from early mistakes and a 14-7 deficit to run away from Midland and earn a 49-28 win at Grand Ledge High School and their first berth in a state championship game since 2014. 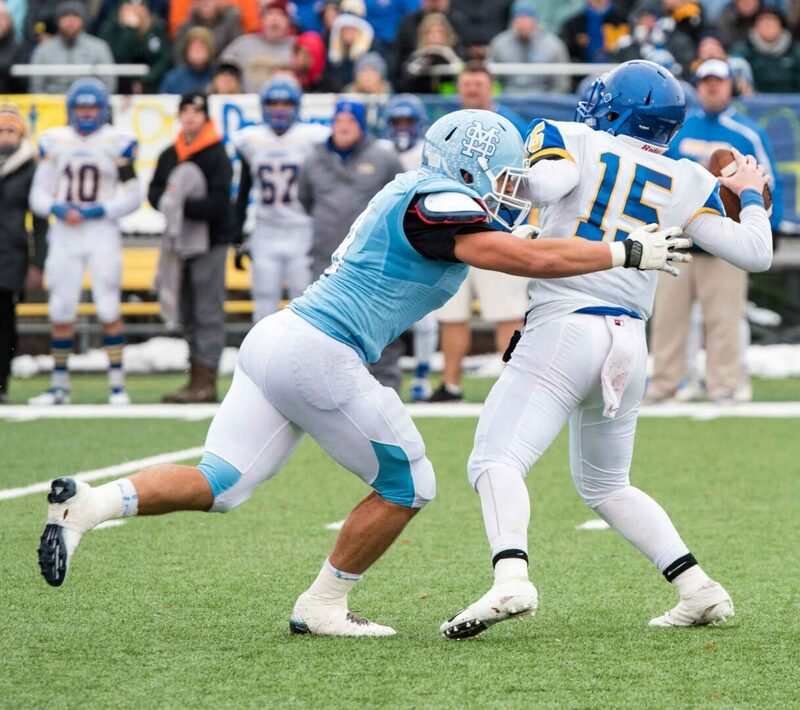 Mona Shores (12-1) advances to the state final game next Friday at 1 p.m. against Warren De La Salle at Ford Field in Detroit. It will be a chance for revenge, because De La Salle is the team that beat the Sailors in the 2014 finals. Senior wide receiver James Gilbert provided a major spark for the Sailors offensively, catching three downtown passes of 26, 50 and 61 yards from quarterback Caden Broersma. Gilbert had a pair of passes slip through his hands early, but shook it off to come through with a big game. Broersma had a big game, as well. The junior signal-caller totaled 291 yards and ran for two touchdowns in addition to the three passing scores. 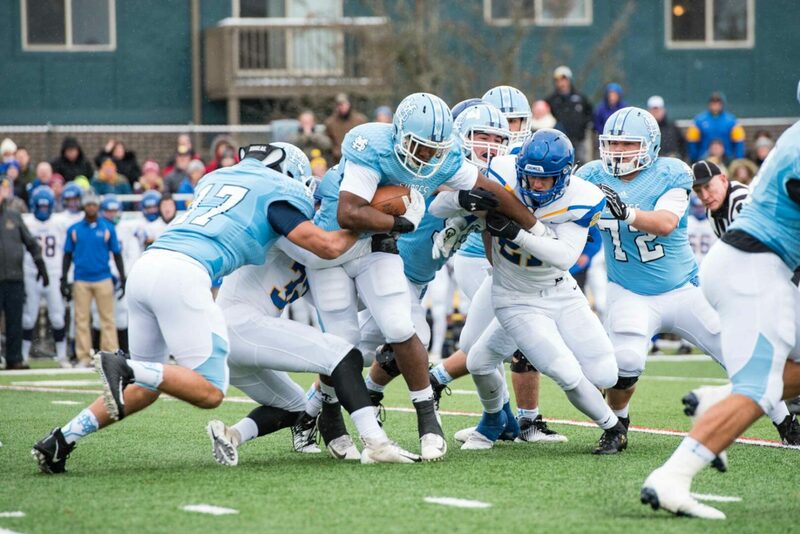 The Sailors struck first on an eight-yard score by Broersma, which was set up by a 68-yard run by Sincere Dent. 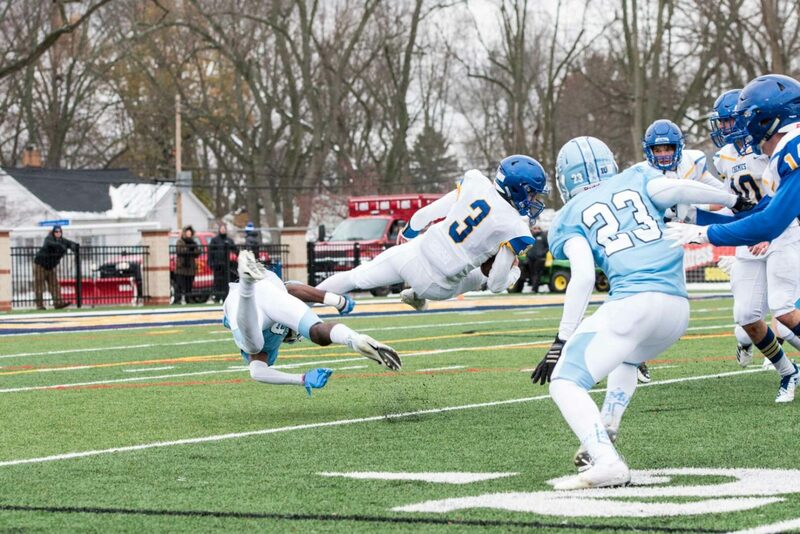 The Chemics responded with a touchdown on their next drive when sophomore quarterback Al Money found Christian Gordon for a 15-yard pass to tie the game 7-7. Broersma fumbled on the next Shores possession, but the defense stood tall and forced a three-and-out. 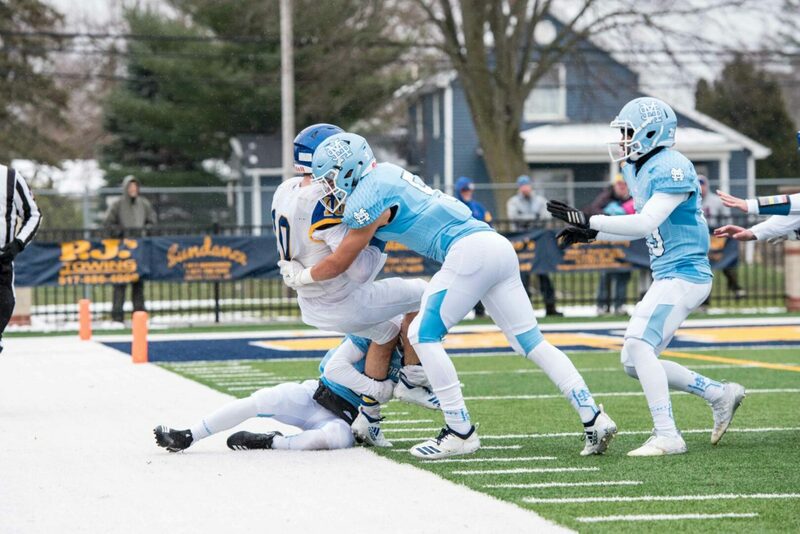 Mona Shores lined up to punt on its next drive, but Midland rushed all 11 players and took the punter down at the 12-yard line, then took over with great field position. Gordon punched in a one-yard touchdown a few plays later to put Midland up 14-7 just 28 seconds into the second quarter. Gilbert scored his first touchdown on a fourth-and-10 play on the following drive, breaking multiple tackles on his way to the end zone, to tie the game 14-14. The Sailors got the ball back with 1:26 to play in the half and took advantage. Broersma completed a pass to Gilbert, who again turned a short reception into a big play, going 50 yards for a score that gave Mona Shores a 21-14 lead with just nine seconds remaining in the half. After a defensive stop to open the second half, the Sailors fumbled on their first play, again giving the Chemics good field position. Midland took advantage, scoring on a fourth down play to tie the score at 21-21. The game didn’t stay tied for long. Mona Shores’ Ke’Sean Sandifer took off for a 75-yard touchdown run on the next play from scrimmage. A botched extra point left the score 27-21 with 4:41 left in the third. That score opened the floodgates for the Sailors. Broersma found Gilbert for another score, covering 61 yards this time, then ran for a 38-yard score to make it 42-21. Tre’shawn Hatcher tacked on the final score for the Sailors with a 44-yard touchdown run with 2:25 to play. The Chemics scored with under a minute left on a pass from Money to Tommy Johnstone to bring the final to 49-28. Gilbert finished with 159 yards on five catches while Dent ran for 118 yards on 13 rushes. 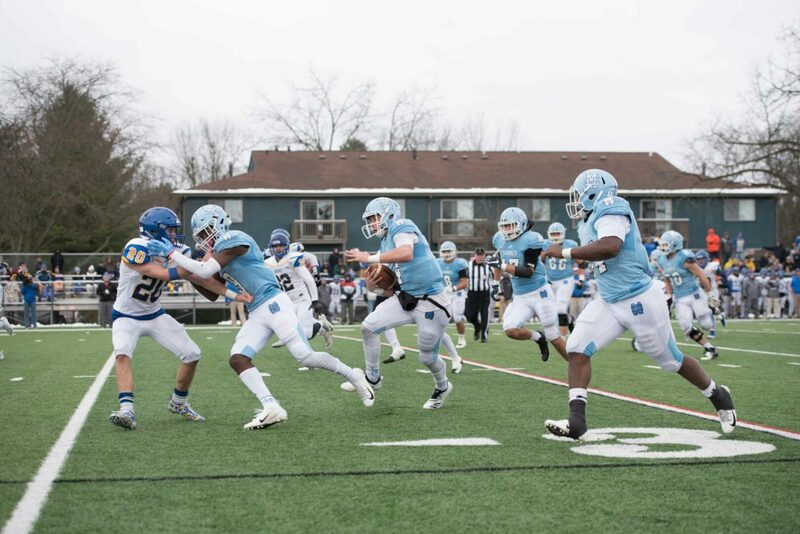 Dent, Kolbe Trovinger, Jackson Neely, Jacob Wahlberg, Colt Stout, Josh Smith and Jay’lin Smith came up with big plays for the Sailor defense throughout the game.